Freedom and Flourishing: Why are economists talking about income distribution? Why are economists talking about income distribution? The distribution of income was once at the core of economics because it helped to explain differences in growth of wealth and population in different nations. Interest in income distribution then shifted to the implications of income inequality for social justice and aggregate happiness. Around the middle of the 20th Century, however, most economists realized that they had no particular expertise in contemplating such matters. Economists retained some interest in income distribution because many governments pursued distributional objectives and it made sense to consider how such objectives might be pursued at least cost. Nevertheless, it is probably fair to say that income distribution became somewhat tangential to the main interests of most economists. 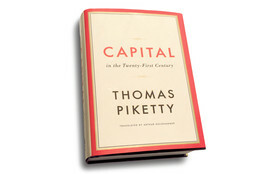 The situation seems to have changed radically over the last few months, following publication of Thomas Piketty’s book, “Capital in the Twenty-First Century”. The interest that leading economists have shown in the book seems to stem from two factors: the increased public interest in income distribution since the GFC; and respect for the amount of intellectual effort that the author has put into his book. While the author may deserve some praise for his statistical efforts, in my view he does not deserve any praise for the clarity of his exposition. The main point being made in the book, over and over again, is that r (the rate of return on capital) tends to be greater than g (the rate of growth of national income) and that r > g implies that “the risk of divergence in the distribution of wealth is very high”. I mistakenly thought that an explanation of the significance of this inequality might flow from the two “fundamental laws of capitalism” expounded by the author. α = r × β , where α is capital’s share of national income, r is the rate of return on capital and β is the capital/income ratio (K/Y). Although r > g could imply that β will rise (if we make the heroic assumption that the capital stock grows by r% per annum) it is still possible for α to fall if r is falling. β = s / g where s is the savings rate. α = r × (s / g) . That implies that what happens to capital’s share depends on what happens to r, s and g. The significance of r > g is not obvious in that context either. I am not alone in having difficulty in grasping the significance of r > g. Scott Sumner noted on The Money Illusion the difficulties he experienced with Piketty’s verbal explanation. However, even if the distribution of income is becoming more unequal, why should that be of concern to us? It seems to me that the best answer is that distributional considerations are relevant to judgements about the quality of different societies. When I looked at these issues on this blog a couple of years ago I concluded that the distribution of opportunities is the relevant variable. Other people may make different judgements about such matters, but I find it hard to see how a society can be judged to be better if it sacrifices opportunities available to low income earners in order to achieve greater income equality. However, I don’t think we can assume that an increase in capital’s share will always be associated with higher real wages. What happens if technological progress makes capital a close substitute for labour? If a substantial component of the capital of the future can be thought of as a work-force of robots, the economic consequences might be a little bit like introducing slave labour to compete with the existing workforce. Real wages might fall under such a scenario, even though national income could be expected to continue to rise. I wrote about that possibility on this blog a few years ago. It is a more challenging scenario than the one painted by Piketty, but I don’t think we should be losing too much sleep over it. There is still potential under that scenario for nearly everyone to be made better off than at present as a result of the introduction of new labour-saving technology. Governments may need to remain involved in wealth re-distribution to ensure that happens, but there is scope for them to do that in ways that are consistent with a high degree of individual liberty.